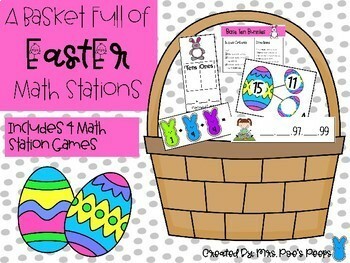 This pack includes 4 games that can be used in math stations with a fun Easter theme. Adding with my PEEPS- This activity has students adding 3 addends. The sums are within 20. A recording sheet is included. 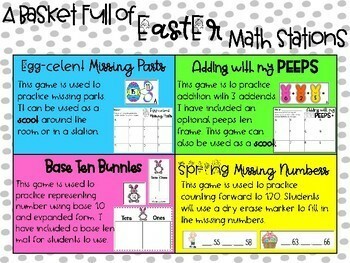 Base Ten Bunnies- This activity helps students practice representing numbers within 100 using base ten and expanded form. A recording sheet is included. 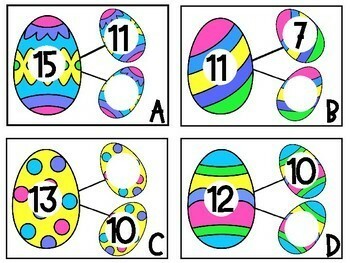 Spring Missing Numbers- This activity allows students to use their number sense to fill in missing numbers within 120.